Arlington, Marysville and Spokane are all trying to eliminate panhandling, urging residents to send people to services instead. It raises the question: What’s the best, or right, thing to do when someone asks you for money? Under a gray sky looking ready to rain, a couple calling themselves travelers asked for money for a meal outside a Safeway just off I-5 in Arlington. Their look — blond dreads, a face tattoo of a pentagram — was different from that of most people coming through the Smokey Point grocery store, but in 20 minutes, they’d already received $3. As cities and towns across the region struggle with a rising and urgent problem of homelessness, the age-old question of whether to give to panhandlers has come back around. 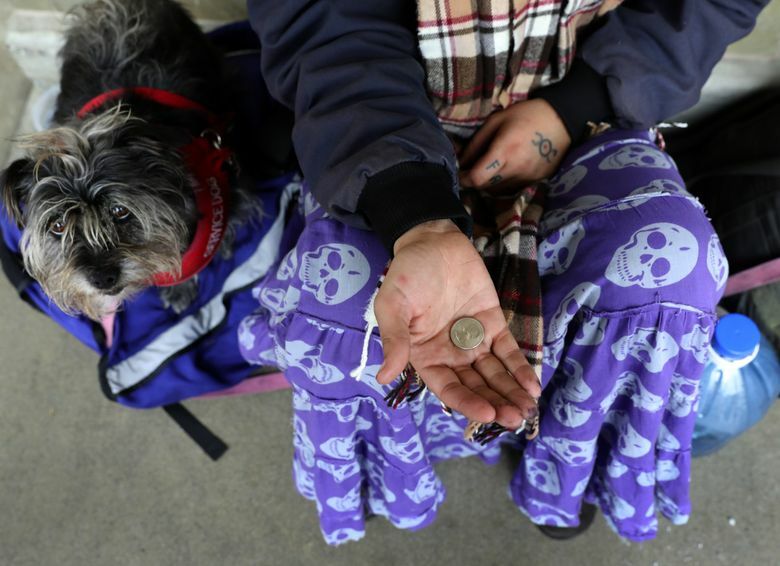 In the last month, Arlington, neighboring Marysville and Spokane have all launched programs to persuade residents not to give to panhandlers. In Marysville and Arlington, fliers listing charities that residents can give to instead are available at city hall. Those fliers do double duty — if a panhandler hits you up, city officials say, give the panhandler the flier. In Spokane, the city erected cheery orange parking meters where walkers can deposit money, instead of in panhandlers’ hands. For better or worse, panhandling is the window through which people see homelessness. Surveys vary widely, but they generally show a majority of homeless people don’t panhandle. Yet one survey found more than 60 percent of people with homes had been asked for money by a panhandler at least once in the previous year. But there’s broad division — especially in Washington — about what to do when someone on the street asks for money. Myron Peltier errs on the side of compassion. On his way home from his job as a security guard at a Marysville health clinic, Peltier used to pass a woman panhandling — an ex-nurse named Sonny with a pet ferret named Peter and a disabling back injury. The two became friends; he started giving Sonny spare cash and sometimes cigarettes. He saw drivers yell at her and police tell her she and her ferret had to move. Peltier moved to Everett last year, but it was Sonny that came to mind when Peltier saw Marysville’s proclamation. 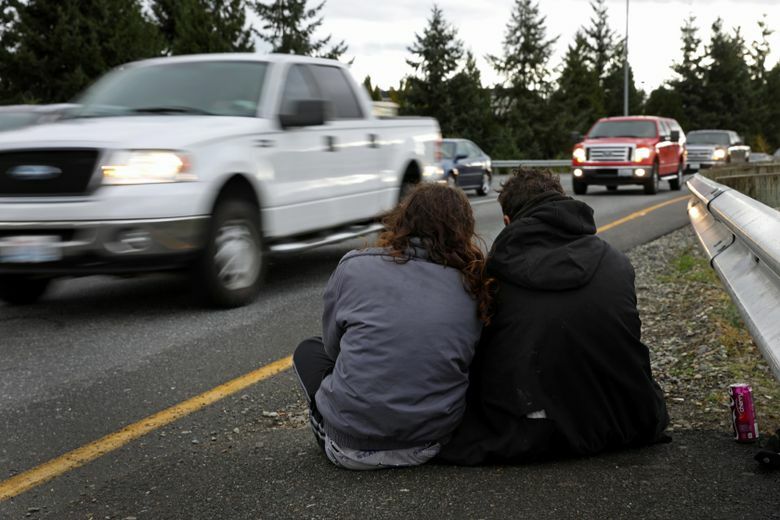 Efforts to discourage panhandlers aren’t new: Both Marysville and Arlington launched similar campaigns in 2014 and cracked down at the same time, restricting times and places where people can panhandle. And cities around Washington have tried to get panhandlers off the streets for decades — Seattle included. The Rev. Rick Reynolds sees both sides of the debate. The executive director of Operation Nightwatch, a food, shelter and housing provider in Seattle, Reynolds doesn’t recommend giving cash to panhandlers — but, he admits, he still does it. Reynolds has been helping Seattle’s homeless population for decades, and he’s seen plenty of efforts like Arlington’s and Marysville’s. They don’t work, he says. For instance: In 1992, panhandling in Capitol Hill was so bad, according to Joe Rogel, who owned the DeLuxe Bar and Grill, that Rogel led a group of grocers and other retailers in a solution. With $5,000 from the city, they printed thousands of coupons that customers could buy in their stores. When panhandlers asked for money, the customers could offer the vouchers, which couldn’t be used to buy alcohol or tobacco. Capitol Hill’s panhandlers seem to have moved to other parts of the city, Rogel said, and so did the vouchers. Grocery stores sold about $2,000 worth of vouchers but only $350 worth was redeemed in the first four months. Rogel says panhandlers were taking the vouchers and trading them on the street for other things. The program died after a few years. That experience, along with others around the time, have soured him on the idea of finding a fix. “I don’t have any sympathy for the homeless group,” Rogel said. Pope Francis would disagree: Earlier this year he urged Christians not to worry about how a panhandler will spend your money — give anyway, even if it is used for something you don’t approve of, like alcohol. Tim Harris sides with the pope. He’s the founder of Real Change, a progressive street newspaper sold by homeless vendors on Seattle’s sidewalks. In his decades working with the homeless, Harris has seen that panhandling is what people do to survive — yes, sometimes that means spending the money on drugs. But Harris admits he’s selective. He never gives to panhandlers at freeway ramps. Last year, Real Change tried to convert freeway-ramp panhandlers into newspaper sellers, but found little interest. Harris thinks that’s because it is more lucrative to beg there. He also believes freeway ramps are the turf of well-networked groups of panhandlers who work in shifts and have a pecking order. That’s the kind of thing those against panhandling emphasize — a suspicion that panhandlers are making good money. In a viral Facebook post, Cheyenne, Wyoming’s police department claimed that after arresting a “transient” for being drunk in public, they found $234.94 on him. They claim he collected it in just a few hours of panhandling. 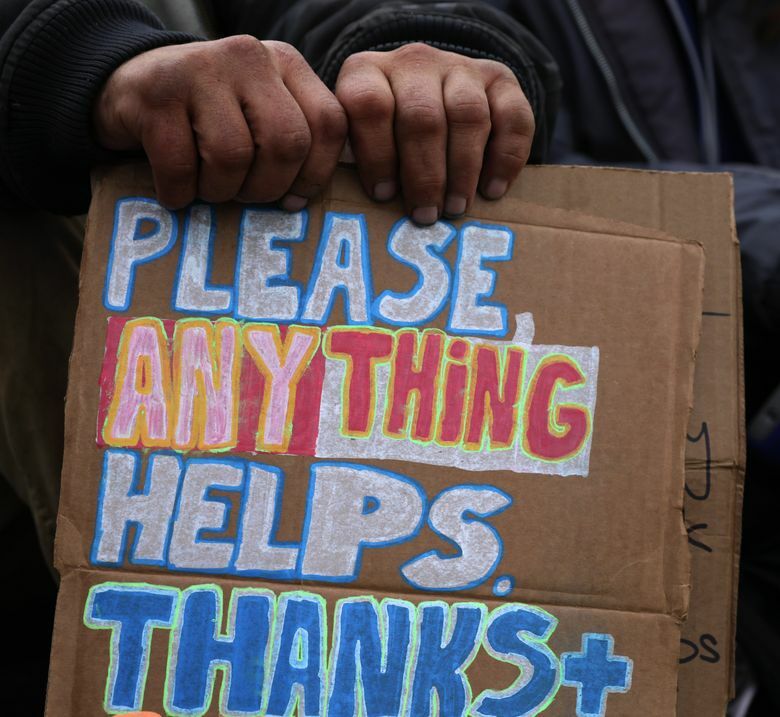 But surveys in cities, including Chicago and New York, found that panhandling appears to be unsteady and not very lucrative, and that desperation, rather than laziness, drives people to panhandle, according to a 2003 study from Pennsylvania State University. That’s what it is for Jason Moran, 42, who’s been homeless and living outside in Marysville for the last three years. He was a union carpenter working on the downtown Seattle Four Seasons hotel when a large cabinet got away from him and he hurt his lower back, he said. Moran appreciates being directed to services, and he’s called the 211 helpline for a referral, but he says he’s often told that resources are limited. There’s a food bank in Arlington, but you have to have a physical address to be served there, and shelters are often full. “It’s difficult because they say there are all these resources, and the red tape to get to these services can be daunting,” Moran said. So Moran finds himself asking for money at exit 206 off I-5. In the two weeks since Arlington’s anti-panhandling campaign launched, Moran hasn’t seen any of the city’s “say no to panhandlers” fliers. But he says the police on the Marysville side have gotten more aggressive, confirming what advocates like Real Change’s Harris say — that these educational efforts to get people to stop giving often come with a police crackdown. Moran was arrested just last week on a misdemeanor charge and booked into Marysville jail for four days. Moran has been in jail before, sometimes for drug-related crimes. Moran says he hopes people won’t be discouraged from giving, because a lot of that money buys gloves, extra blankets, and propane to keep him warm as winter creeps closer. “It’s really humbling to receive the generosity people have shown us,” Moran said. Correction: A previous version of this story misstated Sonny’s pet. It is a ferret, not a parrot.